Was about time I knitted a gift. My dear mum has been sending so many parcels to us (jumpers, dressing gowns, sweet treats, homemade books and puzzles to help F's reading along....) she deserved a thank you. 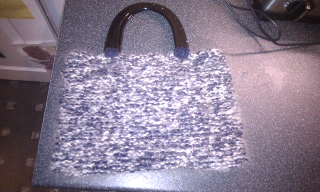 Continued with the fluffy two stranded garter stitch until it was bag length. Attached a shiny black handle and a knitted bow in the lighter tone. Marvellous and rather professional result!! The bow reflected when I took a photo so attach the plain side.